We did not see much of Azerbaijan. One month visa but the necessity of keeping 2 weeks free in Baku meant a relatively hasty ride to the capital once leaving Georgia…..no detours to natures delights. Though we did a 6 km detour to Bum. Off the main road, but joining up so that the distance was not so great, our childish selves decided a photo of Bum was absolutely necessary.. We did not detour to bubbling volcanic mud flats, ancient castles, churches, national parks…..we cycled to, bumped, skidded, pushed along a rocky track…..to Bum. Nothing there bar a small village, but we like small villages, loved the beauty, the trail towards the base of the mountain, clouds swelling and snowy peaks in the distance. 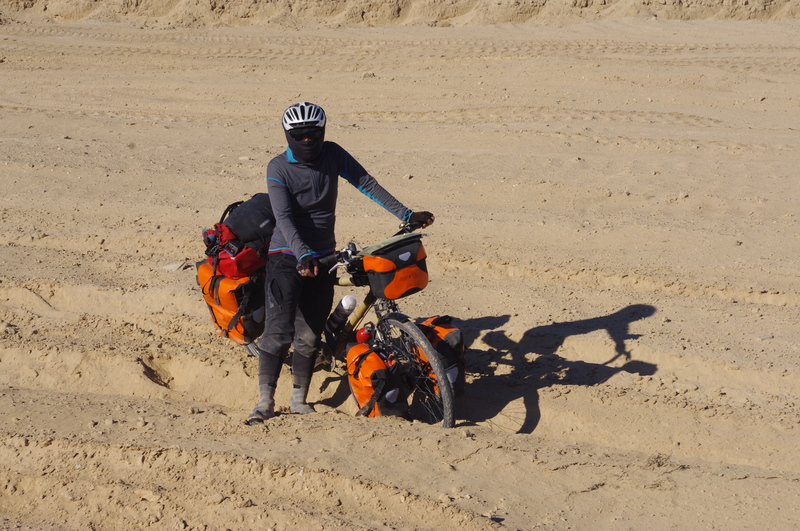 6 km and 2 hours later…..it was flat going, but hard going, we arrived in the back end of Bum. Fortunately the road became bitumen as we passed through. In Azerbaijan the landscape, the climate changes dramatically within a days ride. Our first, we cycled beside the Greater Caucusus. Majestic and filling us with excitement. The trees representing autumn while not so very far away, higher, winter is well on its way. Our first evening we lose sight of the snowy peaks and miraculously find ourselves camping in sub tropical rainforest. Twisted vines, ferns, damp and rotting leaf matter…….And of course…..cows. Strange whooping, howling packs of some kind of animal somewhere close by. Eerily these creatures are present every night, starting up their banshee like howl as the sun blinks out….and quiet, then again and again until we fall asleep. We call them the ‘whoopies’. They are not dogs…..but they set off the dogs into a barking frenzy. Then a day of rain and mizzle. Another night we camp on the edge of a national park. For hours we had cycled on a road encased in dappled golden light, catching occasional glimpses of the crystal clear blue sky above. Shrouded by gigantic trees, possibly beech…..the next morning I had to correct Li from rolling deeper, further into the forest where bears, elk, wolves and other unseen, unheard creatures were protected. We still heard the whoopies. Back to the main road, the trees became smaller, but more colourful…..and rather prickly. Careful where we squat when nature calls. The temperature at night became warmer. And then a day of 30 degrees. 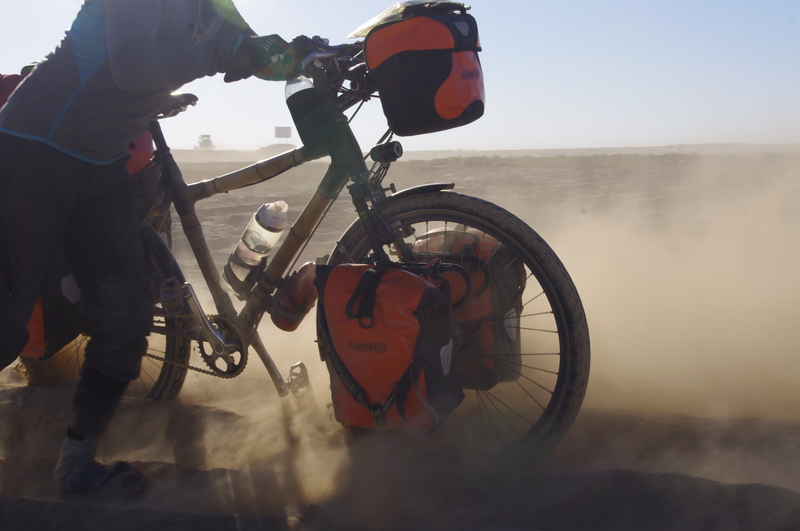 We hit desert, warm and clear and emotionally, visually moving. What we did see of Azerbaijan was beautiful and full of contrast….similarity the small villages, towns, city. There is a lot of money……and no money. The money is flashy, shouting….bling, bling. In rural areas the money is visible in people’s golden teeth. Newly built facades, castle like walls and structures hiding the crumbling and forgotten……Lada or Mercedes. I like the new Lada……simple, tough, efficient and no bling. Azerbaijan produces oil…..the petrol we purchase to fuel our stove is pink, stinks of sulphur and burns rough. In each country we by petrol, the colour, the smell, the burn…..is significantly different. Baku ‘s old town is beautiful, restored for tourists and the rich…..Li does not like it……it is too clean, feels too new. Are the city walls really that ancient? The old city is brand new perfection. Cross a major road…..if you dare…..for pedestrians it is treacherous……and there live the poor, the disabled, the disenfranchised. The sky line is London, New York…..you will find glass, steel, ceramic, dramatic illumination, resembling scenes from around the world. Every where we travel people are fascinated with the fact that our bikes are constructed from bamboo. This is the first country where people notice, are excited that the bike chains are the colour of gold. 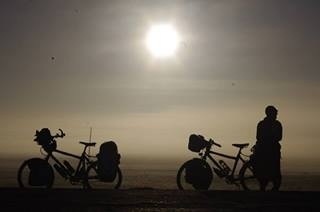 One Response to "Cycle touring in Azerbaijan"